While leafing through a book in search of Gee’s Bend quilts, I happened upon an unusual quilt. It had the look of something woven, a rug or tapestry, or perhaps it was executed in needlepoint. Perhaps the artist made clever use of an ombre-print fabric, arranging it so that the colors seemed to pulse and radiate throughout the piece. What would you think, were you to guess at its construction–a rug? a tile floor? a fussy-cut quilt? Nope. 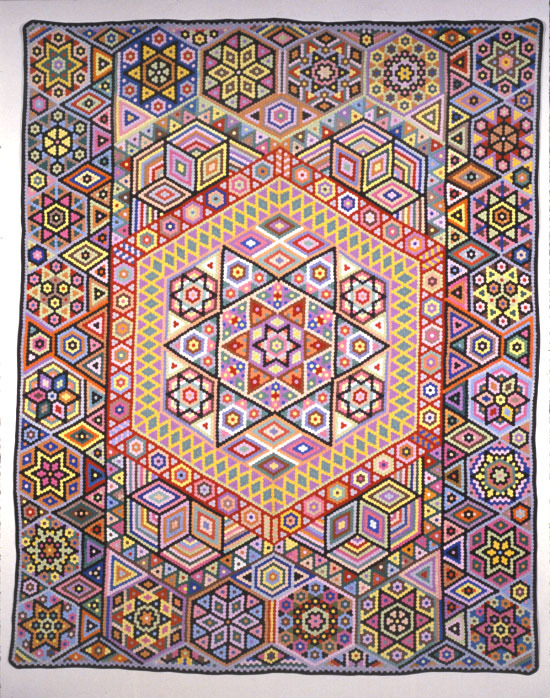 This quilt, measuring 86″ by 95″, is composed of 123,200 pieced hexagons, each 1/4″ in diameter. I AM NOT EVEN KIDDING. Six of these tiny hexagons fit beneath a dime! 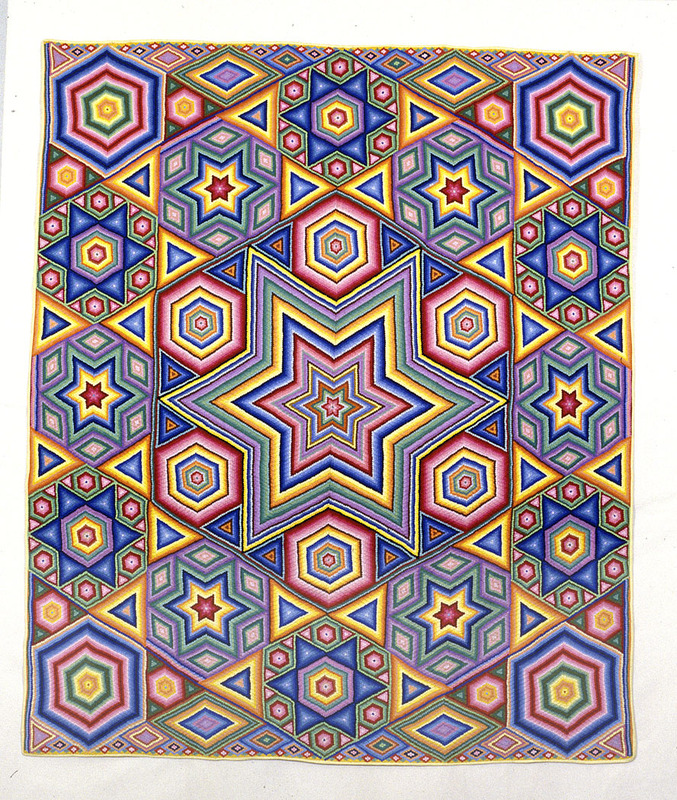 The quilt was made by Albert Small over the course of four years, 1941-1945, during which time he spent at least four hours a day, six days a week working on it. 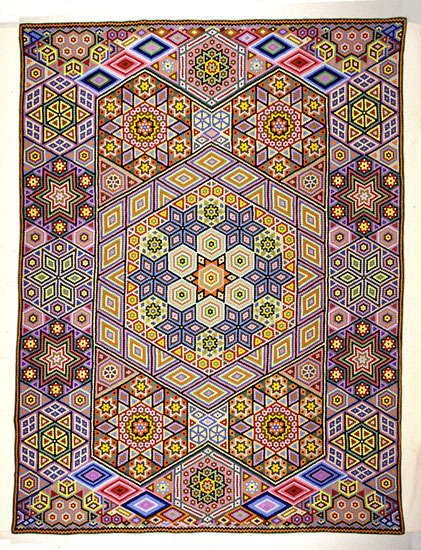 Small estimated he invested about 6,000 hours on this quilt, which holds the world record for most pieces in a quilt. Albert Small emigrated to Illinois from England as a teenager, and grew into a somewhat eccentric adult: he had a large cactus collection, enjoyed painting and carpentry, and was a tattoo artist for a while. For work, he was a heavy machinist and dynamite handler at the Ottawa (IL) Silica Sand Company. Small took up quilting after his wife’s sewing circle, in response to his teasing, challenged him to make a quilt. He is pictured below with one of his quilts. If you are unfamiliar with the method of piecing hexagons, generally executed via a technique called English paper piecing, allow me to further boggle your mind. Fabric hexagons are cut using a paper hexagon template, leaving the traditional 1/4″ seam allowance; they are then basted onto the paper and hand-stitched together, Y-seams and all. Piecing hexagons is a slow and painstaking process. While I don’t respond strongly to these quilts on an aesthetic level, I was immediately struck by the craftsmanship. 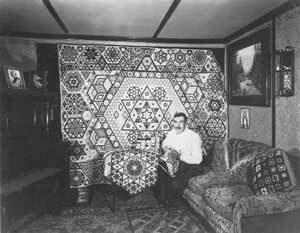 After researching Albert Small further, I began to wonder how these quilts would be received were they pieced by a woman–that is, if the novelty of a male quiltmaker was removed. This is not to take away from Small’s accomplishments. But because patchwork is traditionally a female domain, male quiltmakers are often regarded as exotic.